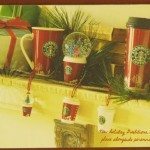 As my readers know from this blog, any time of year is a fine time to talk about Christmas merchandise in a Starbucks. 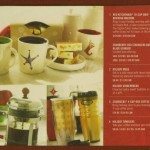 This extremely short blog post is simply a visual look at all the merchandise that Starbucks offered during Christmas season 2006. 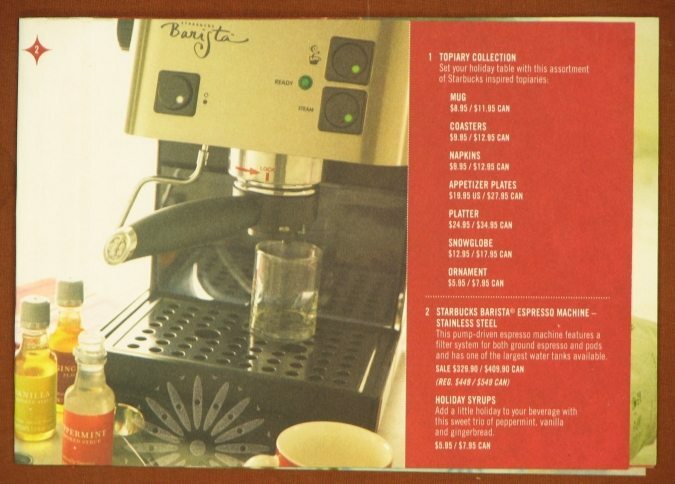 A regular blog reader sent me this little booklet, thinking it could be another chance to memorialize Starbucks history. I enjoyed flipping through this little book, and hope you do too. 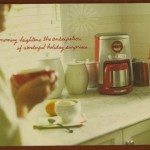 A couple of things that are worth noting about this holiday merchandise: First, there seems to be several options in terms of brewing equipment. I haven’t seen a coffee brewer (other than a French press) inside a Starbucks in a long time. Next, somehow the style of the marketing reminds me a lot of Pier 1 Imports. Molly (who helps me with the photography on this blog) immediately commented that it looks like the marketing takes its cue from a Pier 1 Imports catalog. Of course, once she said that I saw the immediate resemblence. Lastly, I haven’t seen any espresso machines for sale inside a Starbucks in a while either. 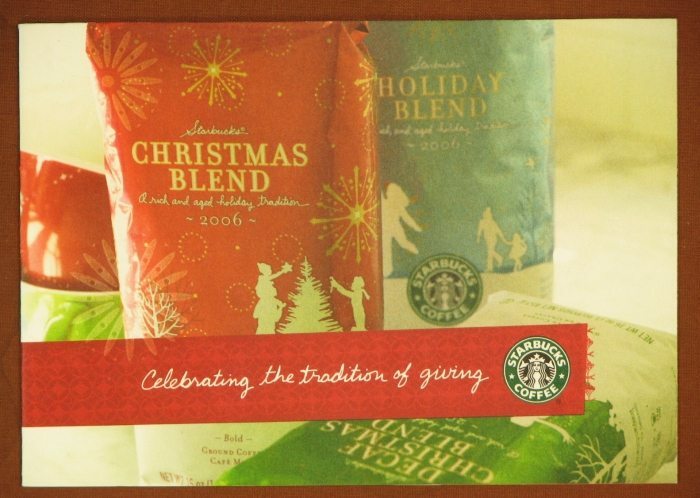 This was only a few years ago, but it seems like Starbucks has changed so much since this 2006 booklet was produced. I definitely wonder what they will come up with for this year! 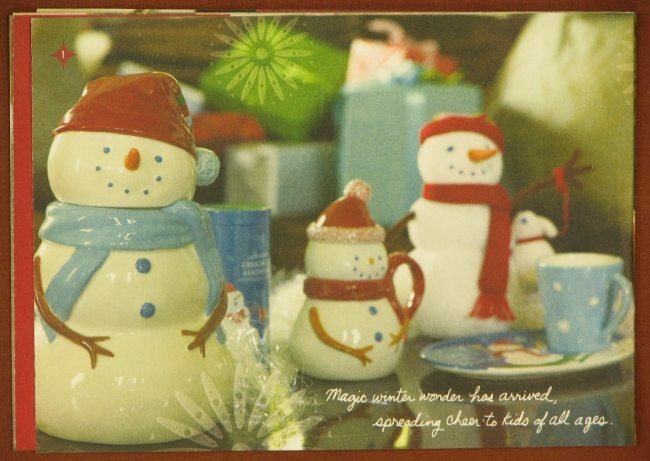 Any guesses on what is coming for Christmas 2010 merchandise? Nordstrom is now selling Starbucks-inspired designer t-shirts. 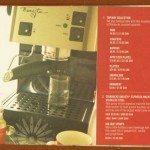 Flashback to 1999 – Starbucks creates Joe Magazine and it tanks. 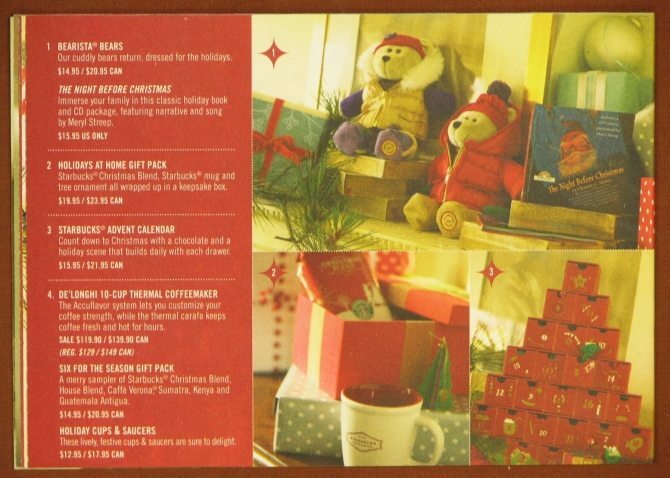 My favorite Xmas merch by Starbucks was this little plush reindeer for they introduced in 2009 I think…it wore a scarf. I still have it here near my desk. It is so cute!! Then I really liked their tumbler, I think from 2008, where penguins are printed on and there was written “let it snow…” at the bottom. I wish they would introduce more generic holiday items for those of us that do not celebrate Christmas. I love looking at all this and yes, I agree, 2006 and SOOOO many chnages since then, it seems MUCH longer than 4 yrs ago! 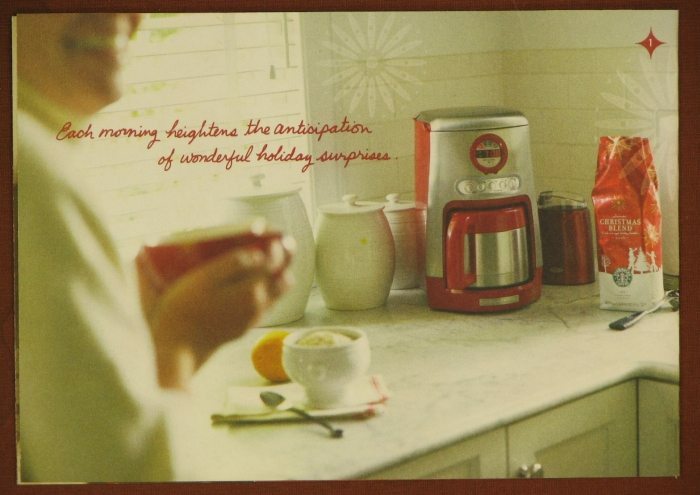 I have that tall sz red (like paper store cup) cup…I get it out every Dec.1st and it is totally my favorite drinking coffee cup. Perfect sz, thickness. etc. Really love it. 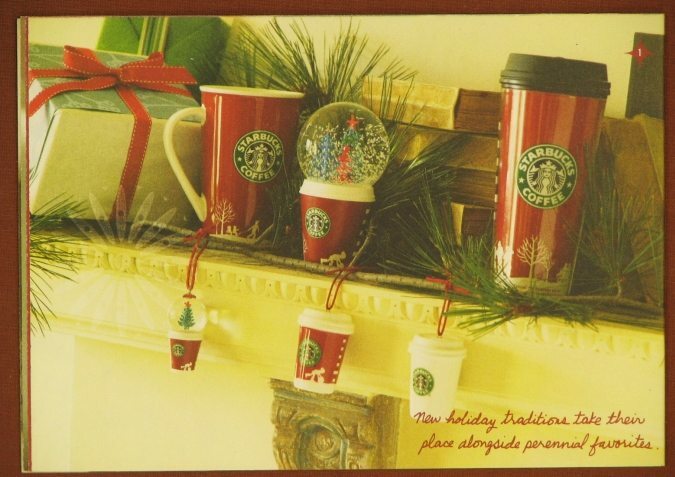 Also have the little latte-like ornaments….I kept a red one (with the lid) and a white one, gave away the snowglobe one as a gift. Also, I agree about the brewing equipment..nothing more than a press, I have, in the 90’s, bought 3 or 4 coffee makers (brew) from them. I miss all that stuff. This is REALLY getting me in the mood for holiday!!! Holiday begins TOMORROW with the pre-launch of the Pumpkin Spice Latte! Soon to be followed by the Pumpkin Cream Cheese Muffin 😉 and then it’s on to the Gingerbread Latte… Ginger loaf… I see an additional 5-pounds in my future. LOL OH! I think I forgot to mention the Cranberry BILSS ;-0 maybe that should be 10-pounds. I love seeing all the holiday stuff. I’m not wishing to see anything particular in the store, though I hope they don’t use 8976543567890 pounds of glittery stuff to decorate this year! It was annoying to leave the store (even just visiting as a customer) and find glitter and fuzz on me hours later. I heard that Holiday 2011 Via targets will be astronomically high because after all how many 12 packs of Via can one stuff into the stocking? Starbucks consumer espresso machines are only sold online. 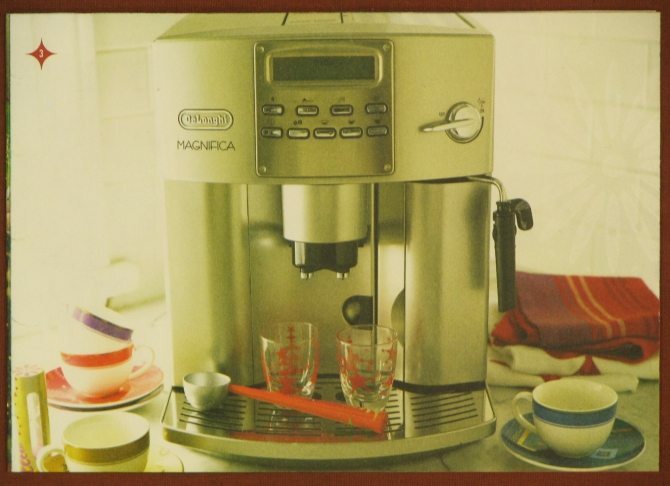 Because who wants espresso when you can have Via? I’m hoping to see the peppermint reusable straws, Will that red tumbler be available in 20 oz? 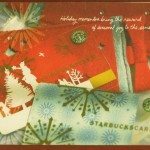 As a former Starbucks marketing partner – and as the person who led the Holiday promotions at Starbucks for several years – I’ll be happy to add some thoughts. (BTW, these are not Starbucks opinions, but mine). Starbucks stopped carrying brewing equipment a while ago. They used to be brewing experts, but as the business focus shifted to beverage instead of merchandise, equipment knowledge among store partners declined. 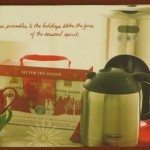 Starbucks used to have proprietary equipment made, then switched to off-the-shelf equipment (meaning you could probably get the same thing at Target or Bed, Bath & Beyond), until now – as you mentioned – you’ll probably only find a press pot at a Starbucks. 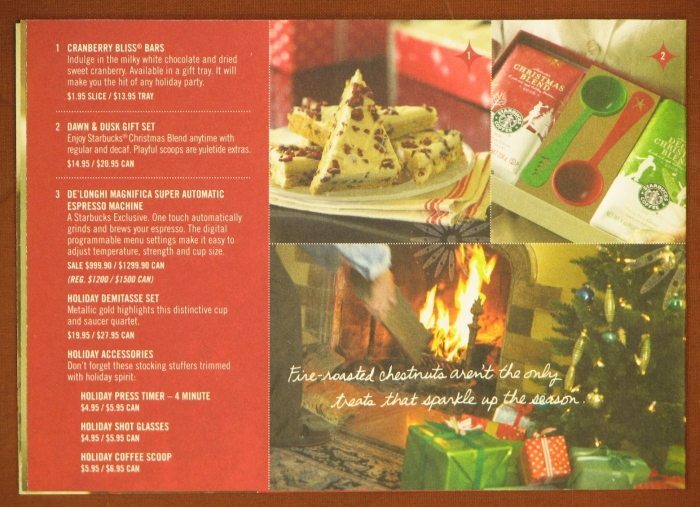 Finally, the photography… Starbucks isn’t in the catalog business. It isn’t something they do all the time. 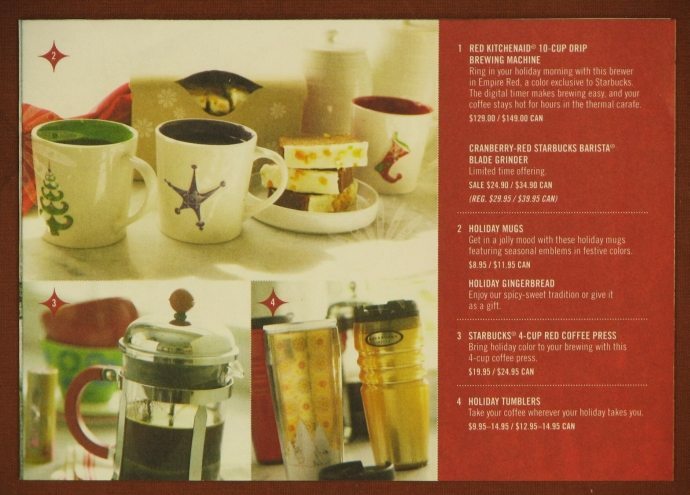 The catalog – I’m sure – was designed to be a take-away item to help perk merchandise interest. It was probably delivered to area businesses, handed-out in-store, and used as a tool when a customer had a question about something. A gift giving guide. Starbucks has always struggled with being in the “retail” business. They’ve called themselves “specialty retail” because they didn’t want to be a “restaurant” or “cafe.” But, they’ve never really acted like a retailer. They’ve never had paper, and boxes and the tools to allow partners to wrap up merchandise for carrying home. (The way a Pier 1 or Pottery Barn would). 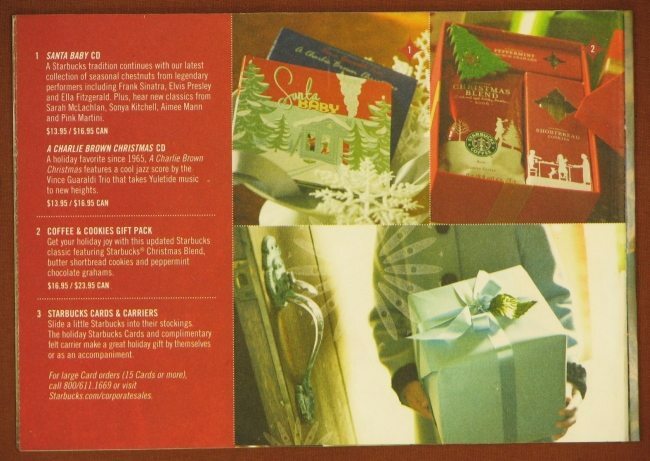 Starbuck has never been thought of as a place to buy “loved ones on your list” Christmas gifts. 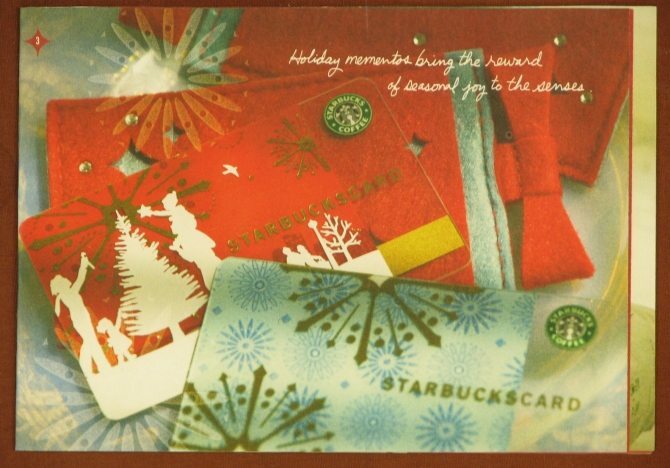 When the Starbuck Card launched, it made sense as a co-worker gift, or something for your dentist. They’ve always been stuck in-between in the customer’s mind. So… the gift guide again, was a way to get folks who are NOT in the store to see what was IN store. I worked at Starbucks for 9 years from 1996 until 2005. 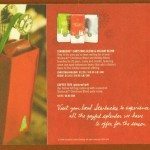 I started opening stores in the NE of the US, did brand marketing in Seattle, and concluded my career helping develop customer service strategy (and the Green Apron Book). 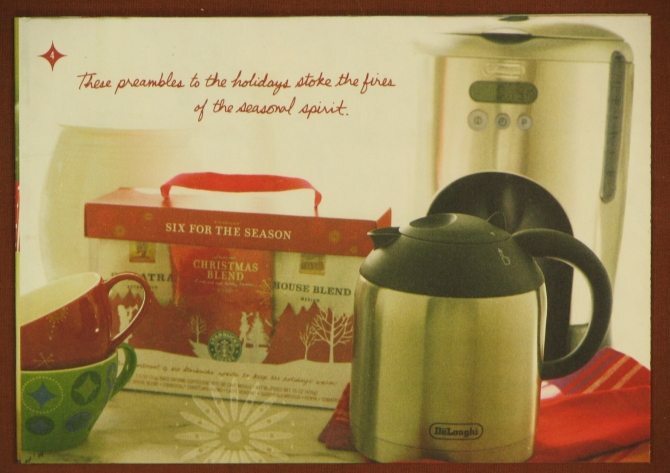 I remember 2006 as being an “off” year for Christmas Blend. My notes show as being much more “peppery” than previous years. Probably a higher mix of Aged Sumatra. But definitely not my favorite. Unfortunately, Starbucks has not replaced any brewing equipment in the store. No espresso machines, no coffee brewers, not even a simple $4 pour-over brewer, like featured in-store for afternoon bold/decaf brewing. Wait, there is one brewer available, the free stir sticks at the condiment bar. Those are used when “brewing” your VIA Ready Brew. 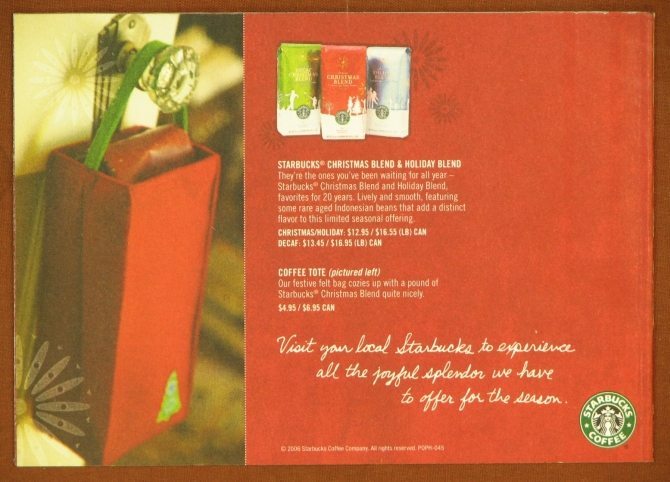 I’m interested to see what is around the corner for Starbucks Holiday 2010 (my 13th holiday season). As a brand new barista I think you might be interested in knowing that I asked for a second green apron book to take the staples out and framed the pictures from inside the book. They are beautiful and remind me of a different time in starbucks. I miss the old wall art, the new stuff is great and all but the old stuff was much more fitting to the brand. I work at Starbucks and we started about two weeks ago talking about Christmas and what this year will bring. Everyone wants to see the stuff NOW!!! At least Anniversary Blend starts next week! @Paul (from Idea Sandbox) I love the Green Apron concept. Thank you! I think that Starbucks realized that the retail space in each store could be better used if they were selling Via than a machine. I love those bears in parkas! @PaulWilliams(Idea SandBox) – Thank you for the great comment. Superb history insights. @LatteRose – Those are adorable Bearista Bears. And I was just looking at the CD also on the same page. I remember seeing that in the stores yet never did pick it up. 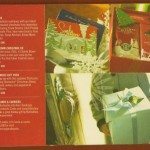 The Night Before Christmas narrated by Meryl Streep sounded intriguing to me, but I never did buy it! 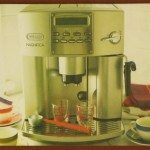 I use the espresso machine “barista”. Haha. I’d vote for a Christmas music CD. And really really gaudy Christmas T-shirts. 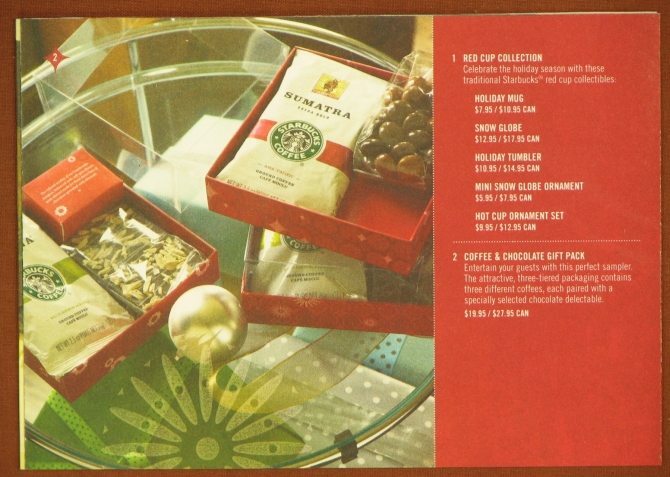 And before I clicked on the photo I thought that white pack of Sumatra was Starbucks socks, so of course now I think that they should make Christmas socks. 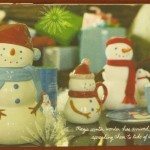 I have the two ornaments, the red and white cups, it was a two pack not a three. I also have a little plush reindeer ornament. Thank you @Paul for your comments. When the coffee machines were being deep discounted and not replaced i figured it was the end of coffee bean being central to starbucks, it’s now about beverages. One starbucks near my old apartment still actively sells brewers, i wonder how they get to? I can’t wait for the holiday drinks, I got a pumpkin spice late today, and can’t wait for the creme brule drink again. 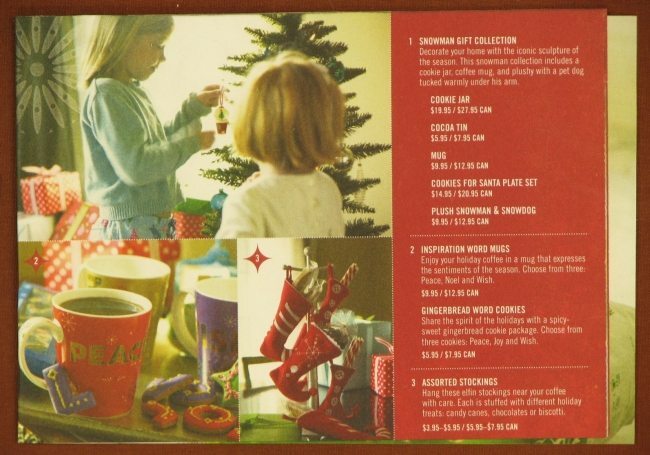 I expect to see the peppermint straw tumblers, ornaments, tumblers, and little sampler gift packs again. @Kaori – You’re getting the Creme Brulee drink in Japan?? Did I read that right? That was such a good one. I rarely buy lattes. The new toffee-mocha thing here in Seattle is too sweet for me. Did your local Starbucks get that amazing crunchy candied-sugar topping that went with the Brulee drink? Oh my god, that was like crack. So addictive. Do you mean Caramel brule or caramel macchiato? b/c they are two different drinks? Unless it’s something different? Never know! Melody, that topping was AMAZING. Try the toffee mocha half sweet. You don’t need full pumps! do NOT like it full sweet but half sweet-very very yummy. @CaBarista and @Kaori – I know that I was talking about the drink that was new in the US last Christmas season. It’s very possible that it is just now coming to Japan (I think that’s where Kaori is?) given that the international markets get different promo drinks at different times. 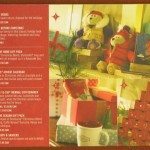 Remember UK had the Cherry Mocha as a Christmas 2009 holiday item, not Spring 2010! Where is our friend Nob? He might know the answer to this too! And yes, that topping was so amazing!! I tried the toffee mocha today, but will try again half-sweet… That sounds better. yes, it’s just too sweet for me! Awesome find, Melody! 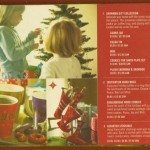 This was my first Christmas working at Starbucks and I remember oh so well all of the merchandise and displays that we had to put together during our overnight Christmas setup. There were these little dioramas that lit up and we had to turn them on and off everyday because they were powered by batteries. Christmas isn’t really as special anymore at Starbucks. I’m pretty sure 2006 was one of the last awesome holidays before the Christmas setup was turned “LEAN” and all of the decorations and stuff came premade and ready to use. 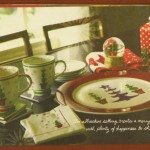 Sad too, because my store sold $5,000 in just merchandise the week of Christmas that year (2006) – now it just seems like the holiday merchandise is boring. I do have so many things left from previous holiday setups though that we use as Christmas decorations at my house! 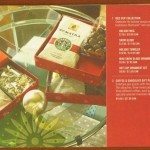 @baroosta – It just seems like everything Starbucks does is becoming increasingly generic, so that it appeals to EVERYONE. It’s a disappointing strategy. On the t-shirt blog post, I thought that some of those Christmas Blend designs would never come back again, or anything close. 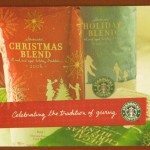 The Christmas Blend logos get more and more generic too. Today I realized that there are now signs with pictures of the new fall promo drinks attached to a chalk board … So baristas don’t have to draw a drink but only write a few words? How sad, it just takes away from the personality of the store. Chalk art is important. You’re right, Christmas at Starbucks is becoming boring. I seriously doubt anything like that mug will ever be in a Starbucks again. 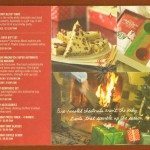 Melody- Two points- I would like to see a more generic centered holiday promotion rather than a Xmas centered promotion although I understand your point. I don’t think if they have a generic holiday promotion it has to be boring. I also miss the chalk art in the stores. As you have said in an earlier thread, some of the chalk art is beautiful and it should continue. And to Denise R I agree that MSI has to be revamped. Something has to be done. Starbucks coffee Japan Ltd releases “Crème brûlée Macchiato(Hot & Ice)” and “Crème brûlée Frappuccino” today. Also, Crème brûlée foods. “Crème brûlée Macchiato(Hot & Ice)” are seems to be a pudding. I mean, it seem to be the stir puddings. I would love to have such an innovative Starbucks market and strategy like in Japan here in Germany…always new and never seen products! AWESOME!! I really loved that Christmas merch from 2006! It reminds me of the early mornings I would drag my behind to work and buy a hot chocolate from the Starbucks near my job. The booklet is amazing. I kinda wish we had more stuff like that these days. But not entirely…I’m very complicated sometimes. I unfortunately don’t remember this, as I hated Sbux until I started working there in 2007. @Melody & CABarista, I can’t believe I missed this conversation! So sorry I didn’t notice. But thanks to Nob-san for the info on Creme Brulee Macchiato! He really DOES know everything about Starbucks japan! Well, I had a Creme Brulee Macchiato today and it was wonderful! I really like drinking it hot, but with the unbelievable humidity and heat here in Tokyo, I ended up getting a cold drink. Still yum, though! But the “amazing crunchy candied-sugar topping” you mentioned? I don’t think we have that here…DARN! That sounds SO GOOD! Would love to get that topping for xmas this year! 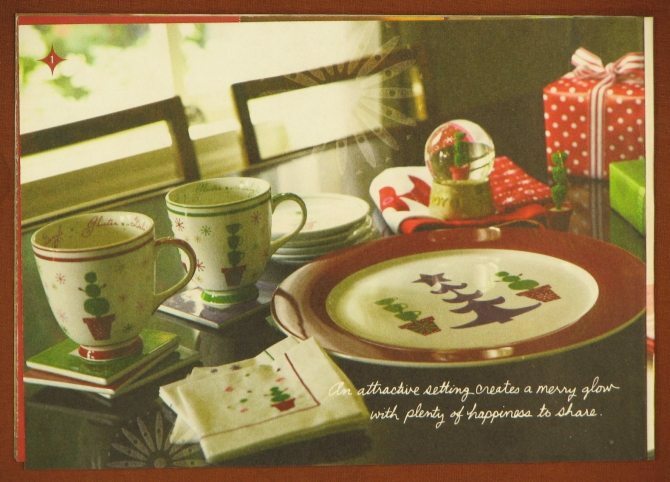 I love the little holiday mug and saucer/plate set from the 2006 collection. I have 5 of them and still looking of a sixth. They are unique, and so cute.